I’ve been making low carb berry shortcake so, obviously, I’m thinking about the Strawberry Shortcake dolls I had as a kid in the 1980’s. Ahhh. I can almost smell the dolls through the screen. They had such wonderful fruity smells. Even the villains, Sour Grapes and the Peculiar Purple Pie Man smelled good. And I love how each character came with its own spirit animal. Good stuff. Also good stuff, is this recipe for low carb berry shortcake. It’s made with my new friend, the Carbquik Baking Mix. 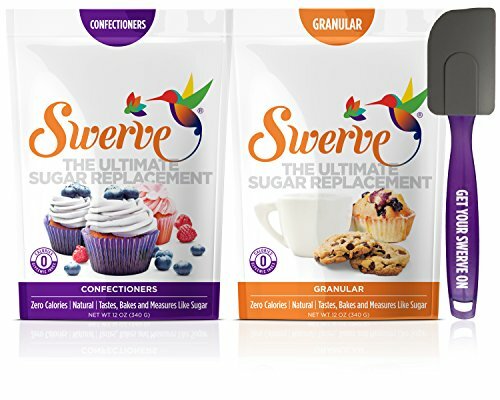 This is one of the best low carb flour alternatives I’ve found so far. (It’s made from wheat though, so you should avoid it if you are gluten intolerant or on a ketogenic diet.) Just like Bisquick, this mix is great for pancakes, biscuits and shortcake. To make it into shortcake, you just mix it up with water, cream, sweetener and melted butter and bake it in a round cake pan. Soon you’ll have a light and fluffy berry shortcake with only 5g net carb per slice. The Peculiar Purple Pie Man would be particularly impressed. This recipe for low berry shortcake uses Carbquik Baking Mix as it’s base. 1. Preheat oven to 375 degrees F and grease a round 9 inch cake pan. 2. For the shortcake, mix together Carbquik, water, cream, melted butter and 6 tablespoons sweetener in a large bowl. The batter will be very thick. 3. Add batter to pan and smooth the batter down equally with your hands. Sprinkle 1 tablespoon of sweetener on top. 4. Bake for 20-25 minutes until browned on top and a toothpick in the middle comes out clean. 5. For the berry topping, add 1/3 cup blueberries, vanilla syrup, 1 tablespoon sweetener and water to a blender and blend for 1 minute. Mix liquid with the rest of the berries and set aside until needed. 6. For the whipped cream, mx together cream and powdered sweetener in a large mixing bowl. Whip with an electric mixer until stiff peaks form. 7. Once shortcake is done baking, allow to cool in the pan for 15 minutes before serving. Serve each slice topped with berries and whipped cream. If you liked this Strawberry Shortcake, then you might like my recipes for Strawberry Rhubarb Cobbler, Strawberry Layer Cake, or Strawberry Pie. 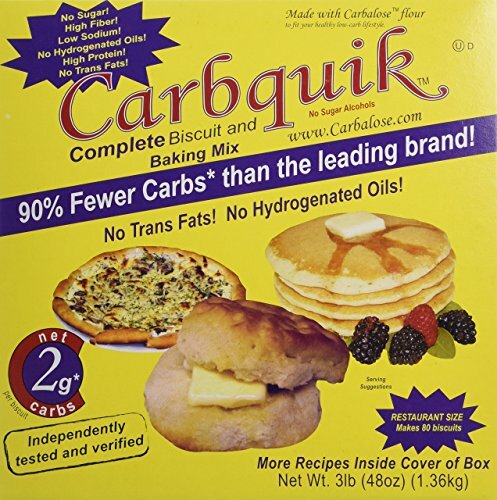 I am really digging Carbquik too. Do you have any other recipes that use it? I sure do. Just type Carbquik into the search bar and you’ll see the other 6 recipes I’ve used it in. I love the stuff.